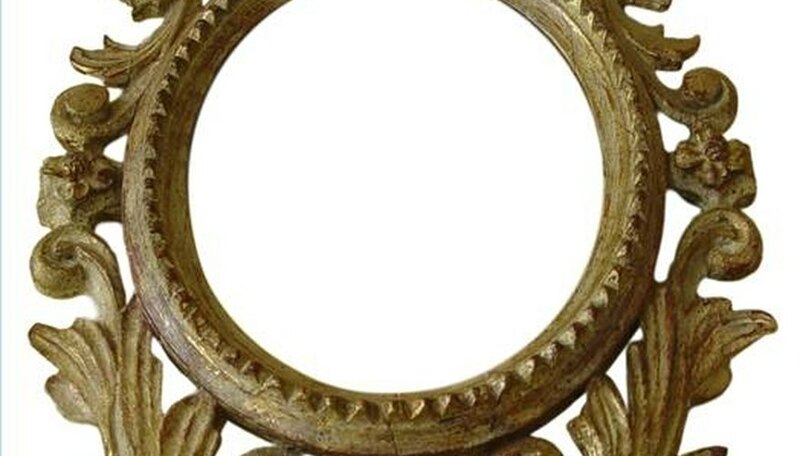 You may not know what a gesso mirror is, but if you have any heirloom mirrors that have ornate frames, you may own one. The frames on the gesso mirror are large and ornate and most gesso mirror antiques today come from the Victorian era. These frames add a unique touch to any decor. The name "gesso" means "chalk," one of the key ingredients of gesso, a carved or molded relief frame. Follow the history of gesso and you'll find that it was extremely popular in ancient times to build reliefs of various objects. It's found in the tombs of ancient Egypt as paintings on the panels and sarcophagus, but probably most identified with the country of Italy. The original gesso work was raised work on panels because the gesso of ancient times was not flexible and made of animal glue and whitening. Frame makers before the late 1700s made gesso frames that were limited to the ruling and wealthy class, since each one was created with painstaking precision. Find mirrors that have repeating patterns along the edges. Most of the patterns are flourishing, taken from nature and reminiscent of the Victorian era. The frame makers used a cream made from whitening and parchment and applied it with a brush as an underbase for gilding and some lightly raised relief, but in the late 1700s, they made molds of gesso. Composition gesso from rabbit skin glue, linseed oil, whitening and rosin allowed the frame makers to press the gesso into molds to create ornamentation. As it dried, they sometimes molded the shape from the drying gesso, used a stamp for the patterns, pressed it into molds as noted already or carved out the gesso for the desired effect. The use of molds allowed mass production. Many of these didn't survive because the rosin and linseed oil shrank and caused separation of the ornamentation from the frame. Gesso mirrors might have a rectangular shape like the mirrors found today, but many don't. They often come in ovals, hexagons or other irregular shapes. In the mirrors that are rectangular, they usually have a crown that displays a relief of an animal, flowers or flourishes. They can also have a base below the mirror that changes the outline. Each mirror is an art piece as well as a functional home accessory. The real popularity of gesso mirrors came in the late 1800s with the Art Nouveau period. The return to nature and swirling designs of the era, plus the creation of mass production methods made it possible for most working class families to own a gesso mirror. Expect to see gilding over the gesso. Many of the gesso mirrors offer gold or silver gilding to add to their already ornate design. Often the mirrors have gilding on the edges of the gesso scrollwork against the white of the frame. Sometimes the entire mirror frame is gilded. The gesso was the glue that held the gilding to the mirror. The original gesso bonded closely to the wood and in order to remove it, you had to destroy some of the base. Its properties allowed the gilder to burnish the gilding. Examine the mirror closely and have it appraised. Works done before the Art Nouveau period are far more valuable. Some copycat work done in the late twentieth century may not have any value at all. Only a good appraisal can judge the date of your gesso mirror. Because of all the intricate designs, often gesso mirrors are useful as focal points in decorating. If you own one, use the workmanship as a point of interest in your decor regardless of the cost. Grandma's mirrors tend to date to the Art Nouveau period. Wait before you paint over that mirror frame. If you suspect the mirror has an early production date but paint over the frame, you're likely to dramatically reduce the value. Changes done to early pieces of artwork are seldom beneficial unless a true art restoration process and professional does them.